Cheeky little chap isn't he, but if he gets into your roof space he will cause mayhem. 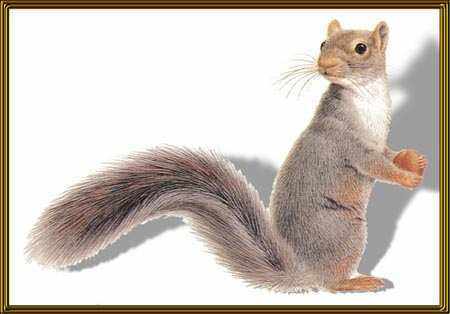 The grey squirrel is larger than the red, usually about 10 inches long with a large bushy tail 8 inches long. In winter the coat is pale grey with longer fur than in summer. Occasionally black individuals turn up. Greys began appearing in the countryside between 1876 and 1929, having been released deliberately or accidentally from a number of centres, especially London Zoo and Woburn Park in Bedfordshire. They have now invaded every county of England, except for much of East Anglia and Cornwall, and are established in central Scotland and central Ireland. So far the greys have not reached the Isle of Wight. Habitat: Mixed broadleaf/conifer woodland usually containing beech and oak. Autumn-hedgrows, gardens, fields away from woods, also mature conifers. Active early morning and late afternoon all year. Not territorial up to 5-7 per hectare. Food: Buds,shoots,ripe and unripe fruits,nuts,bulbs,seeds,(peas,beans,maize,wheat),eggs and young of both songbirds and gamebirds. Bark damage is greatest during the months of May to July, particular damage to sycamore and beech which are about 10-40 years old. Less than 5% killed. December to January and then again May to June. She can have 1-2 litters per year. The life span of the female is between 4-6 years. The life span of the male is between 2-3 years. Mortality rate is about 75% per annum. Grey squirrels have survived repeated Government-sanctioned attempts at extermination by shooting, trapping and poisoning. Greys do considerable damage to trees when present in large numbers. They attack trees in early summer gnawing at the main stem, seeking the sweet, sappy layers immediately beneath the bark. Sometimes the tree is completely ringed and as a consequence will die. If it doesn't die then it will usually be checked or spoilt. It is now illegal to import a grey squirrel or keep one as a pet. They will adapt to any area covered by trees, whether broad leaved or conifer, with an average density of about 5 per acre. Greys will live in suburban parks and gardens, becoming tame enough to feed from the hand. A squirrels nest is called a drey and is made up of a ball of twigs, often with leaves attached, and lined with grass, moss and fur. Summer dreys are attached to branches, but breeding and winter dreys may be inside a hollow tree. There are two breeding seasons, as mentioned above, resulting in offspring called "kittens". Both reds and greys keep to well defined runways along tree branches in their territory. Due to their food preferences above and the fact that they store surplus food which they do so by burying it makes squirrels a useful vector in seed dispersal and tree planting. Firstly there is proofing itself. Proofing: This is self explanatory it is no earthly good trying to trap or bait squirrels when there are numerous entrances for their brothers and cousins to use at a later date. Grey Squirrel (warfarin order) 1973. Wild Life and Countryside Act 1981. Control of Pesticides Regulations 1986. Destructive Imported Animals Act 1932. Read about all the ins and outs of all the laws involved as there are quite a few, any pest controller who reads this page and is going to undertake squirrel control must make sure that he/she is well informed. Ideally it would be advisable to have attended a Vertebrate Management Course, which not only teaches biology but legislation and control procedures. Just for an example, under the Destructive Imported Animals Act 1932, if you catch a grey squirrel it is illegal to let it go again. These regulations go on and on. Spring Traps: These are traps which when the squirrel takes the bait will kill. These are only usable by professionals and are extremely humane. Again they are baited with maize. Poison Bait: There are many many regulations covering this aspect of control and rules applicable in England are not always relevant in Scotland and vice versa. This aspect of control is mostly used by the Forestry Commision and other similar bodies. Shooting /Drey Poking: Again not normally carried out by pest control companies but by the bodies mentioned above. Drey poking is removal of the nests with long poles.